Sometimes it’s difficult deciding what handbag to choose in the morning before setting off to work. Much of it comes down to what you need for the office and throughout the day. Will you be going to lunch? What will you be doing after work; will it be straight home or maybe meeting friends for drinks later? A lot goes into consideration, because a lot often happens during the length of a day. And let’s not forget everything one may take to work: laptop, papers, folders, magazines, iPad, smartphones, etc. It’s a rare day that anyone shows up to work empty handed. And many also bring work home. So choosing the correct handbag on any given day is not as simple as it may seem. One of the reasons we created our Reid satchel is that we wanted a roomy, utilitarian design that that could be carried nearly everywhere. It had to be sturdy enough to safely hold a laptop without looking generic. It needed to be stylish enough to use as a mini weekender and as a carry-on whilst traveling. We envisioned an all around statement handbag that fit into our modern, fast paced life while retaining a sense of history and craftsmanship from a bygone era. The satchel had to be a timeless wardrobe staple that would carry a fashionable through any stage of work and life. That seemed like a huge feat to design, but we did it anyway. It took several samples from our leather craftsman and lots of tweaking to reach our final design. Even though we may be biased, we loved the end result. Mind you, designing a handbag in a brand new silhouette is no easy feat. Our original Reid satchels were nearly a year in the making. And we took our time designing the interior. We have always been mindful to make the interiors of our designer handbags as nice as the exteriors. It doesn’t make sense to carry a lovely bag with a shoddy interior. We added interior touches we thought would be appropriate for a busy life. Since many of us carry more than one smartphone, we added three pockets that fit most phones. These pockets are also great for water bottles. Next we took the iPad into consideration and added a pocket for that as well. And for those who love to carry their handbags without a wallet, we included a leather credit card holder. We also prefer interiors that are sewn down and not loose. Finally, we sourced a beautiful high performance fabric and custom quilted it to become a lovely, but sturdy interior design that supports the handbag and its contents well. The added quilted backing protects our beloved and essential tech products. The black leather that makes up the front flap, handles, and trim is practically water-resistant and it’s a medium weight so once the handbag was completed, it was not heavy. 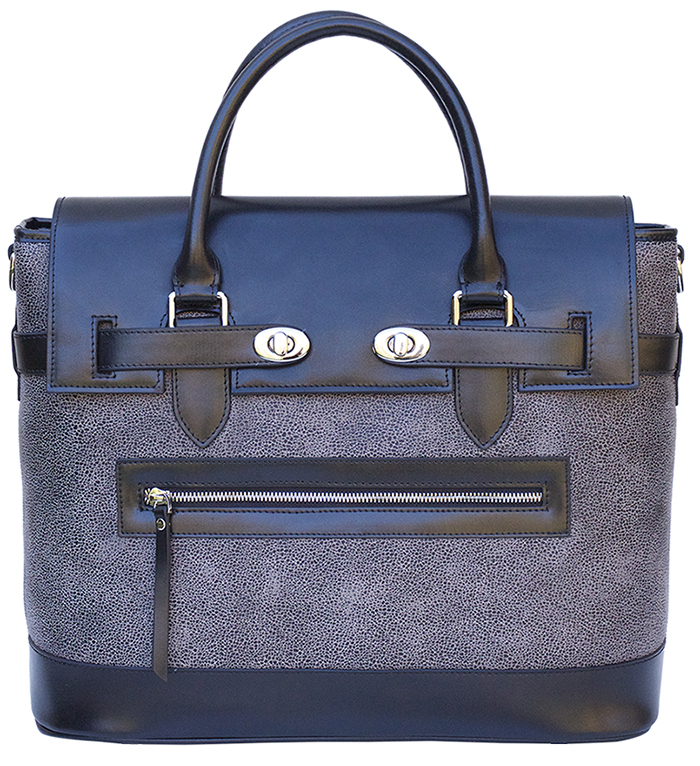 Our Muir Street Reid satchel is one of those handbags that will take you from work and then on to dinner and drinks. It’s large and spacious, but not bulky. The sleek design blends well with nearly any outfit. It elevates workwear with a polished and balance effect. Muir Street’s speckled leather body is edgy, but also quietly chic. It’s not a bold statement bag, but one we hope will be carried for years to come. We like to think it’s a go-to handbag that serves many purposes. If you do attend a function after work, it doesn’t announce itself as an oversized work bag. Yes, its large and roomy, but it fits into many different scenarios throughout the day. We have received emails and feedback from editors, bloggers, and style stars letting us know they carry their Reid satchel nearly everywhere and it doesn’t let them down. One well known style star from London even wrote us a handwritten letter to tell us people often stop her on the street wanting to know the origins of her PLIA Designs Reid satchel. We love this feedback because it shows that the satchel design is indeed an ‘everywhere’ handbag. Fitting fashion into a busy life shouldn’t be difficult. Not only should it be fun, but it should also be easy. Fashion is also about developing a personal style. A style that fits your personality, but also work and everyday life. Accessories, especially handbags, are a great way to add style to your wardrobe. A new handbag should compliment your wardrobe and not work against it. A fabulous handbag is one of the greatest fashion equalizers. They are easy to shop for online and a handcrafted style, such as our Reid satchel, is decently priced as far as designer handbags go. It’s also nice to add a new handbag to your wardrobe that fits into different scenarios of your life. With a busy life, choosing a handbag in the morning should be easy and not a difficult task. That’s one of the reasons we are highlighting our Muir Street Reid satchel. It fits seamlessly into a busy life; accommodating essentials that we use and need. Browse PLIA Designs collections of designer handbags.